Amber Williamson was fielding questions about Oregon Passenger Rail at the Albany Farmers Market. Say what you want about California and its many problems, but in contrast to Oregon our southern neighbor is moving with breathtaking speed on the subject of high-speed rail. I had not thought much about the Oregon project since a steering committee of Willamette Valley leaders recommended two potential routes for further study in December 2013. But then on Saturday, it sprang to mind again when I spotted a stand set up at the Albany Farmers Market. 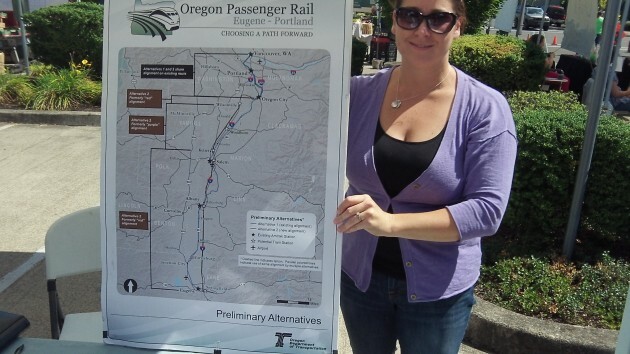 Amber Williamson was there for Oregon Passenger Rail, ready to hand out information about the $10 million study to increase passenger train speeds and usage between Eugene and Portland. The hope is to publish in two or three years an environmental impact statement on a preferred route alternative. Then the state hopes to get federal grants to actually build whatever needs to be built to accommodate more and faster trains. Not much faster, not really high-speed, but enough faster that you could get to Portland in less time than driving on I-5. 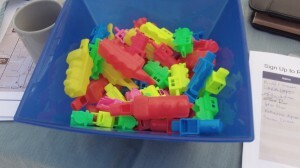 I wondered if people were interested. Yes, apparently so, Williamson said as she was taking down her display at mid-day. More than 50 people had visited with her at her stand. Her bowl of plastic toy whistles still had a pretty good supply, though. A panel of the California Court of Appeal has just cleared the way for a state bond sale of more than $8 billion to finance early parts of the $68 billion project. The court ruled against Kings County farmers and residents who contended the scheme should not go ahead until all the financing was arranged. Also the California High-Speed Rail Authority this month got federal approval to construct a 114-mile segment between Fresno and Bakersfield, and it hired a firm to oversee construction of a 60-mile stretch from Fresno south to the Tulare/Kern county line. The state had already started construction of a 29-mile segment north of Fresno. In Fresno itself, the agency housing parole officers has had to find new quarters because its buildings are in the way of the line. With the population density of Oregon, it’s just too high priced and underutilized for the expense. We already have a very efficient high-speed rail system in Oregon – its called freight trains. Train is an excellent method for moving freight. It is not so good for moving people in a highly dispersed, lightly-populated area such as Oregon. Consider that there are more people in the city of San Diego than there are in the entire state of Oregon. This might make high-speed passenger rail service feasible in some areas of California but probably not even there. America’s population is so widely dispersed over such a large area that passenger rail is simply not economical. On the other hand, moving freight long distances – cowabunga!